Speak the universal language of love to the one who makes your heart soar with our exquisite bouquet of one dozen multicolored roses. 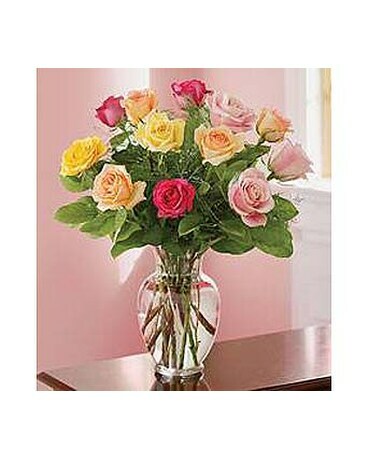 Our florists select twelve of the finest, long-stemmed roses in a ravishing rainbow of colors and beautifully arrange them with delicate florals in a classic glass vase. Colors and varieties may vary. Arrangement measures approximately 22"H x 15"D.